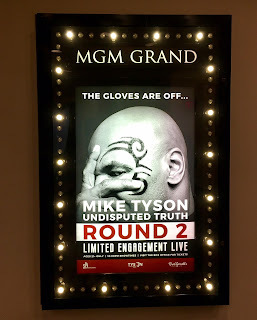 During Mike Tyson's boxing days I never thought I'd someday be going to see him do a one man show in Vegas, and at a comedy club no less. 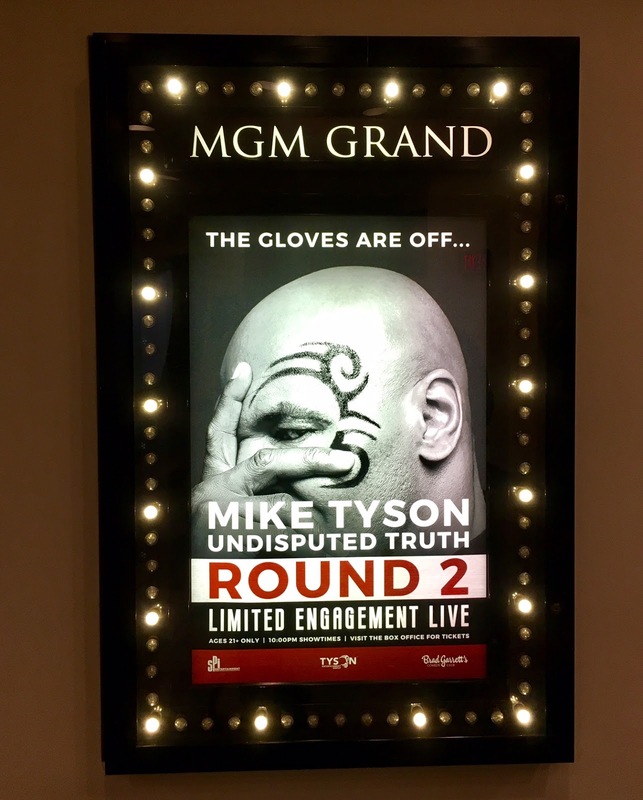 The former Heavyweight Boxing Champion Mike Tyson is back onstage with Undisputed Truth 2, which debuted here in Vegas earlier this month and is a sequel to his one man show from 2013. That show debuted in Las Vegas and went all the way to Broadway, then a TV Special and a book. For this show he chose to open it at Brad Garrett's Comedy Club at MGM Grand. Mike Tyson enters the comedy stage differently than he entered his boxing matches. There's no flashy robe, shiny shorts or entourage. Just music, and then he appears onstage and introduces himself with humility. He immediately sets everyone at ease by talking about his recent "sports injury"...which consisted of falling off a hover board, an accident that led to back surgery. During his last show in 2013 he talked about his early days and how he got into boxing, how it saved him because at 13 years old without a dad and growing up in a rough neighborhood he'd already been arrested 38 times. He shared his past troubled relationships with women, drug use and the tragic death of his daughter. His new show Undisputed Truth 2 is more about the history of his boxing career. He talks about the opponents he fought along the way, some of the more controversial things that happened outside the ring during that time, and about his friendships with late celebrities such as Tupac Shakur and Michael Jackson. He also bemoans middle age and its impact on his life which he is becoming all too familiar with at age 51. He talks about regretting how he had embarrassed his kids with some of his actions and how he gained 100 lbs while in rehab joking "I'm an emotional eater." One can tell that he's still working on this new material but that's what I like, the imperfect moments, the beginning stages of a show when the performer is finding his way. I would like to see this show again on one of the last dates here in town, to see how it's been fine tuned and how he's fine tuned his performance before he hits the road on tour to other cities. While watching the audience react I heard a lot of laughter, but not always when Tyson expected it. Laughs or not everyone seemed to be listening intently. Someone like Mike Tyson will always be a curiousity to the average person even if not a boxing fan. He is someone who lived his professional dream. But on the other end of the spectrum he also fell far from the top to the very bottom, with drug abuse, prison and bankruptcy. Most of us wonder what this journey would be like, the extreme ups and downs. These past several years like a true champ he has picked himself up and risen from the ashes to do what he can now, which is to entertain while being his rough, oddly sweet and comedically talented self. I love to see someone re-invent themselves, take chances and share with others so openly. What better way to take control of your own story than to tell it yourself? His show is worth your money and time. Word is there's a movie in the works about his life that will star Jamie Foxx and be directed by Martin Scorsese. Also check out his cartoon series Mike Tyson Mysteries.